Mike Ullery | Daily Call City of Piqua Street Department employee Bill Cox spreads ice melter on sidewalks in the downtown area early Thursday morning after a night of freezing rain left ice covering exposed surfaces everywhere as the area got its first taste of winter weather for the season. City of Piqua Street Department employee Bill Cox spreads ice melter on sidewalks in the downtown area early Thursday morning after a night of freezing rain left ice covering exposed surfaces everywhere as the area got its first taste of winter weather for the season. 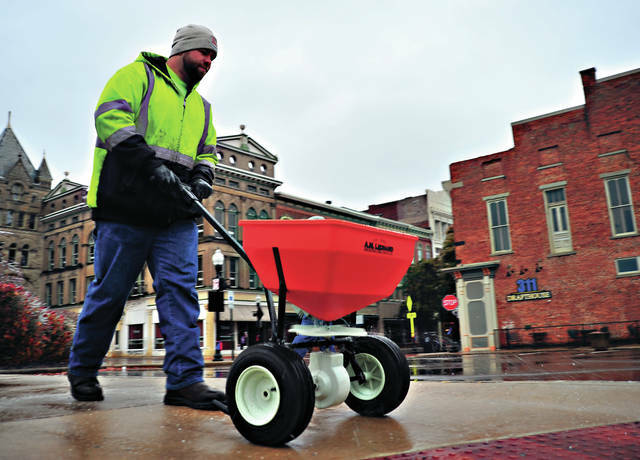 https://www.dailycall.com/wp-content/uploads/sites/30/2018/11/web1_111518_weather_icemelter.jpgMike Ullery | Daily Call City of Piqua Street Department employee Bill Cox spreads ice melter on sidewalks in the downtown area early Thursday morning after a night of freezing rain left ice covering exposed surfaces everywhere as the area got its first taste of winter weather for the season.